← Kids Eat Hong Kong: Where to eat with kids this November! 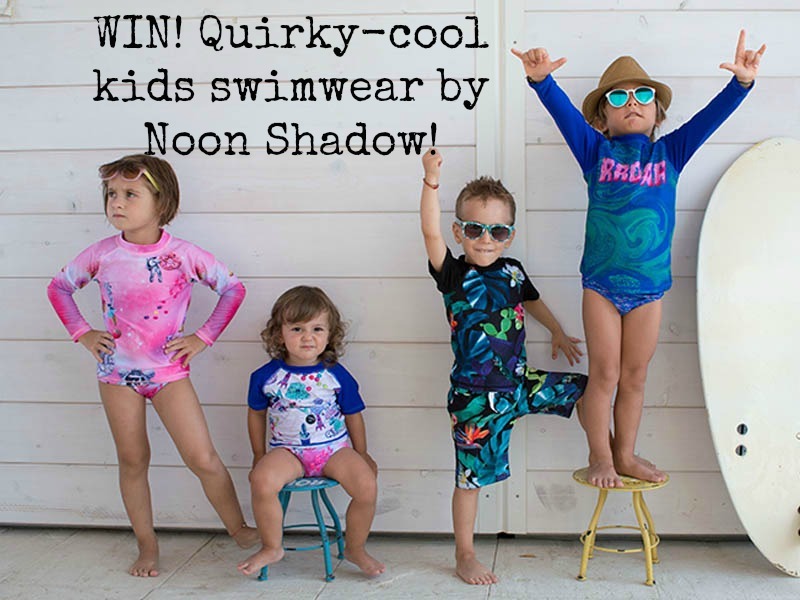 Win awesome kids swimwear from Noon Shadow, plus reader discount code! THIS COMPETITION IS NOW CLOSED! Thanks to everyone who took part and congratulations to lucky winner Charlie, who’ll be bagging US$80-worth of a swimmers for her totally on-trend toddler! Got a Christmas sun holiday coming up? Then step right this way as I twirl my ringmaster’s moustache (note to self: book wax) and introduce you to… drumroll please… NOON SHADOW! Although they’ve been around since 2014, this cool kids swimwear brand splashed onto the scene here in Hong Kong earlier this year with its UPF 50+ swimmers. So far, so yawn, I hear you say. But Noon Shadow swimmers are no ordinary togs – these rad rashies, sweet shorts and hot hats come liberally sprinkled with a truckload of awesome. 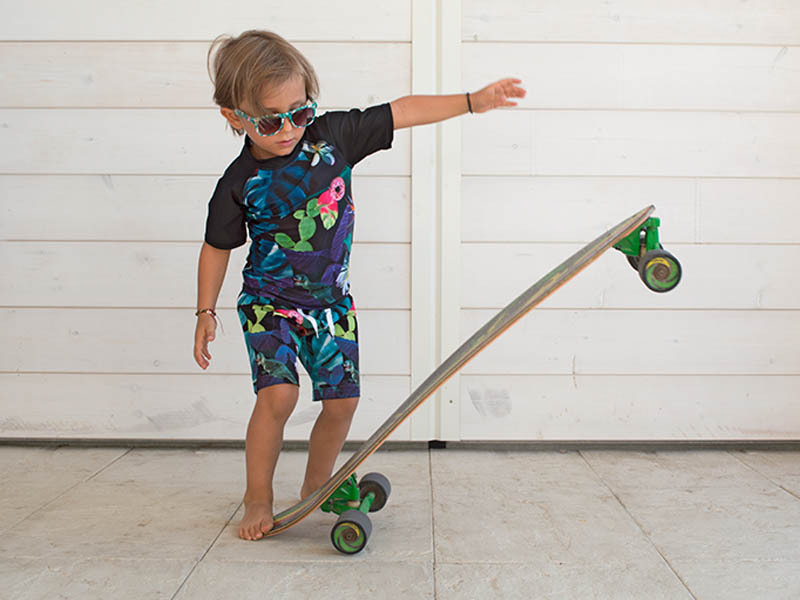 The brand’s designs feature wonderfully quirky prints – think dinosaurs popping wheelies on a bike while spacemen swirl around iced doughnuts – and are unisex, which gets a big thumbs up from a mum sick of skulls and crossbones, cheeky monkeys and superheroes on her boys (mums of girls – I imagine you feel it’s time to “let it go” when it comes to Elsa, amirite?!). We’ve been testing out some rashies, leggings and shorts for a few weeks and I have to say we’re pretty impressed. My eldest insists on wearing his Doodle Bug rashie on the bus to swimming lessons (although happily he balks at doing the same with his Lo-Fi Pants), while his little bro is right at home in his long-sleeved Roar rashie and Lo-Fi Leggings (is it wrong that I really, really want a pair of these for myself?). They are quick-drying – I managed to test this quite thoroughly by forgetting to pack a towel for swimming one day and not realising until after the lesson (#parentingfail), haven’t bobbled and wash well without any fading. Pricing is also pretty reasonable, ranging from US$8-35 (about HK$62-272) and it’s about to get even more so! The nice folks at Noon Shadow are offering all Accidental Tai-Tai readers 10% off their order! Just enter HAPPY10 at checkout to bag your discount! And that’s not all – I have a US$80 Noon Shadow voucher to give away to one lucky winner! Just answer the following question (be creative!) and I’ll pick a winner at random on Monday 21st November and hook you up with the lovely ladies at Noon Shadow to claim your spoils! Many thanks to prize sponsor Noon Shadow – go check them out at noon-shadow.com and don’t forget to use HAPPY10 at checkout for your 10% off!